PROs please let me know whether analysis is right? Very nice chart, the pattern is coming valid when the fibonacci ratios are one of the real fibonacci value, instead the range you are finding to match here, but, it will be fine if not all, but, at least major numbers, ie: 3out of 4 ratios comes an exact FIBO ratio. By the way I am not PRO, but I would like to share my humble idea for joint studies, please take it that way. 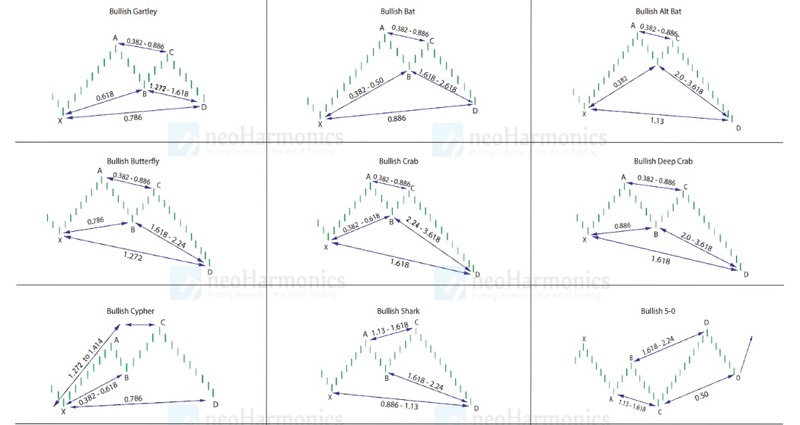 It’s a very newly adopted pattern, in 2000 only, Scott Carney, a firm believer in harmonic price patterns, discovered the Crab. According to him, this is the most accurate among all the harmonic patterns because of how extreme the Potential Reversal Zone from move XA. A reverse chart will be true for bearish gartley. @padiyaraa, Thanks a lot for the information. Very much appreciated. For that you have to learn about Gartley patterns and its 4 harmonic relations to each adjacent legs. A harmonic progression is a sequence of real numbers formed by taking the reciprocals of an arithmetic progression. Equivalently, it is a sequence of real numbers such that any term in the sequence is the harmonic mean of its two neighbors. So watch for a pattern, which resembles an M or W shape, then coordinate with a Fibonacci ratio matches the rules of a Gartley pattern. I found this beautiful information in out TV site.